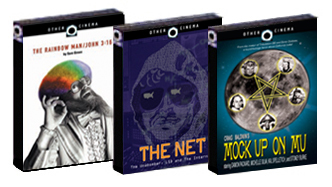 The Other Cinema Digital label provides an alternative platform for the distribution of extraordinary film works. We celebrate peculiar visions and offbeat sensibilities, drawn from the contemporary underground as well as the archives. Be it auteur, exploitation, or industrial, OCD delivers a decidedly different audio-visual experience—ingenious, comic, critical... dangerous. Click on any of the icons below to watch a trailer! Available Now NO LONGER AVAILABLE!